One of the keys to understanding Barolo and Barbaresco lies beneath the surface of the Langhe, home to both wines. The Langhe hills, which rise up on the right bank of the Tanaro River, are composed of sedimentary rock from the Oligocene and Miocene epochs, although the area's original formation began earlier, some thirty-six million years ago, with the collision of the European and African plates. The Langhe is located within the Internal Western Alpine Arc, at the junction of the Alpine and Apennine thrust belts that formed the eponymous mountain chains. Yet the most fundamental geological event for the area was the formation of the Piedmont Tertiary Basin, which has fascinated geologists for well over a century: many of the geological ages, used internationally, are named after areas within the perimeters of the Basin, including Tortonian after Tortona, Serravallian after Serravalle, and Langhian after Langhe. This basin of deep water started forming in the Early Oligocene, and continued through the Serravallian and Tortonian ages, collecting a succession of sediments over 4,000 meters (13,123 feet) thick, consisting of mudstones and fine grain particles. From the Oligocene to the early Messinian (a time interval of twenty-eight million years) the basin was filled by normal marine waters, as is testified by the existence of marine fossils (both micro and macro). Then, some six million years ago, still during the Messinian age, the basin was disconnected from the Atlantic Ocean and exceedingly high salinity in the water was caused by fast evaporation, as the presence of fossils of marine protists, insects, and fauna suggests. This event "left a significant amount of marls (fine grained clay and carbonate sediment) and gypsum" before eventually filling up again very fast at the closing of the Messinian (5.33 million years ago), when the connection with the Atlantic ocean was re-established," explains Francesca Lozar, a micropalaeontologist at the University of Turin whom I interviewed for this book along with her colleagues Marco Giardino and Eleonora Bonifacio. Eventually, the submerged land was pushed above the water. According to Marco Giardino, associate professor of applied geomorphology at the University of Turin, "About five million years ago, strong seismic activity beneath the Langhe Basin, as the western part of the Piedmont Tertiary Basin is known, thrust the submerged land upwards, causing the trapped water to escape and forming the Langhe hills." Giardino, who also consults for Nuoverealtá, a small a group of united Barolo and Barbaresco producers, explains that the Langhe hills are technically defined as cuestas, ridges formed by tilted sedimentary rock. The tectonic activity that created the hills was followed by severe erosion that swept the younger sediment, rock, and debris from the top of the slopes to the bottom, creating different deposits of varied sediments between the highest and lowest areas, and may be one reason why certain grape varieties do better than others on different parts of the same hill, although altitude and sun exposure also play crucial roles. Giardino adds that another decisive factor in the makeup of the Langhe occurred just sixty thousand years ago, when the Tanaro River, the Langhe's major waterway, changed its course from north, heading toward Turin, to present-day east, toward Asti and Alessandria. "The Tanaro's eastern course accelerated erosion, enhancing the cuesta formations of the Langhe hills and at the same time separating Langhe from the Roero area, which remains lower. It also meant that the water eroded the hills down to the much older substratum below. Much of the eroded sediment in the upper areas of the Langhe washed down to the Roero, which did not experience the same violent uplifting as the Langhe, and hence the Roero has younger, sandier soils," explains Giardino. This chronic erosion on Langhe's steep slopes remains a major challenge in the area, and many growers today plant grass between the vines or let it grow spontaneously to help stop deterioration and above all landslides, which sometimes occur in the area after torrential rains. In terms of viticultural performance, the Langhe's soils and geology were already being lauded as far back as two thousand years ago, starting with Pliny the Elder in the first century A.D. In his celebrated tome, Natural History, Pliny wrote, "The cretaceous earth that is found in the territory of Alba Pompeia, and an argillaceous soil, are preferred to all others for the vine." Starting at the end of the nineteenth century, contemporary chroniclers began defining the area in strictly geological terms, which, because of persistent erosion that limits the amount of topsoil that forms, are still widely used today to define the Langhe's terrain. The first attempt to dissect the Langhe's growing areas came in 1879 when Lorenzo Fantini began writing his monograph, "Viticoltura ed Enologia nella provincia di Cuneo," which he completed in 1895. He was perhaps the first to write on the Langhe's Miocene origins and to indicate the best vineyard sites in Barolo and Barbaresco, but in 1930, Ferdinando Vignolo-Lutati, a professor at the University of Turin, fellow at Turin's Academy of Sciences, and honorary president of the Piedmont section of Italy's Botanical Society, published what would become the benchmark work on the geological makeup of the Barolo growing zone, with a particular focus on Castiglione Falletto. Vignolo-Lutati, a native of Castiglione Falletto in the heart of the Barolo denomination, divided the Barolo growing zone into three ages: Helvetian (now replaced by the term Serravallian), Tortonian, and Messinian. According to Lutati, "Almost all of Castiglione Falletto, Monforte d'Alba, Castelletto and Perno [the latter are hamlets of Monforte d'Alba], Serralunga d'Alba and parts of Barolo and Grinzane" were of Helvetian origin comprised of "alternating layers of beds of sand, sandstone layered with marls and sandy marls" that were "generally gray or yellowish sporadically interspersed with layers of bluish gray marls." Lutati went on to write that much of Barolo, a small portion of Castiglione Falletto, most of La Morra, and Verduno were instead Tortonian, "formed principally of gray and bluish gray marls." Lutati also maintained that the nature of the terrain in La Morra and Verduno was more complex, being formed in both the Tortonian and the Messinian ages, and that these villages have calcareous and chalky formations, which echoes the description of Verduno given decades earlier by Fantini. Generally speaking, the Langhe is composed of marine sediments characterized by a substratum of alternating layers of marls (consisting of clay and calcium carbonate) and sandstone, and besides being formed in three geological ages, the area also has three principal geological formations. The oldest in the Barolo growing zone is the Lequio formation, from the Serravallian and Tortonian ages, and is found predominantly in Serralunga d'Alba and in parts of Monforte d'Alba, home to the more structured and long-lived Barolos. The Lequio formation consists of silty marls, made up of clay and calcium carbonate, and sandstone, ranging from light yellow, almost white, tending to gray. The second formation, Sant'Agata Fossili Marls-predominantly from the Tortonian age and part of the Messinian-consists mainly of calcareous clay and marls that are bluish-gray. It is typically found in the villages of Barolo and La Morra, which generally produce the most perfumed and elegant Barolos, and in Barbaresco. The third formation, Arenarie di Diano d'Alba from the Serravallian and Tortonian ages, is particularly rich in sand (for the denomination)-especially in the subsoils. This formation is found primarily in parts of Castiglione Falletto, known for producing Barolos with both structure and elegance. These geological formations are fundamental in the Langhe, even more so than in other areas, according to Eleonora Bonifacio, soil scientist and professor at the University of Turin. "To put it in context, the most developed soils in the world are in the Tropics, where it is difficult to identify the original material that broke down to create the soil there. Soils in the Langhe on the other hand are not very developed due to continuous erosion and the consequential reshaping of the surface that sweeps away the topsoil and hinders its transformation. This is why we can use geological formations to divide the Langhe growing area; if the soil is not very developed it maintains the particle size distribution of the rock. On the other hand, this makes it more difficult to really study the wide variability among actual soils, which exist even if the rocks are the same," explains Bonifacio. She adds that because identifying the diverse soils found throughout the Langhe requires physical and chemical analysis, the area's soils have not been mapped out on a wide scale. One of the few studies done on the area's soils was funded by the Piedmont Region and published in 2000. The study, coordinated by lead researcher Moreno Soster, analyzed various aspects of the Barolo growing area in the first half of the 1990s, and one of the most interesting outcomes is the pedological table the researchers compiled between 1991 and 1993 of fifteen test sites. According to this pedological table, the soil with the highest percentage of sand in the growing zone is found in Castiglione Falletto, followed by Serralunga, then Novello, Barolo, and finally La Morra, which has the least amount of sand and sandstone in the denomination but the highest amount of clay. However, this data is not wholly confirmed by the region's impressive data bank, Banca Dati Regionale dei Terreni Agrari-Laboratorio Agrochimico Regione Piemonte, whose data has been compiled by numerous soil studies conducted at the request of individual growers on their respective holdings in municipalities throughout the region. According to the data bank's statistics, in terms of the major Barolo villages, parts of Monforte d'Alba have the most sand followed by Barolo, Castiglione Falletto, Serralunga d'Alba, La Morra, and Verduno. To keep this argument in context, I'd like to point out that the percentage of sand found in the soils and subsoils in the Langhe is far lower than the amount found in the Roero: an average of 22.9 percent in the major Barolo villages as opposed to an average of 32 percent in Roero, with some villages in the latter denomination, such as Vezza d'Alba and Montà, having soils that consist of 44 percent and 50 percent sand respectively according to the region's data banks. In general, soils and subsoils with a high percentage of sand and sandstone drain quickly, meaning that vineyards located in sandy terrain, such as those found in certain areas of Monforte d'Alba, Barolo, and Castiglione Falletto, perform better in rainy years, while in drought years they suffer from water stress more than those vineyards that have a higher percentage of clay, which retains moisture. Vice versa, areas with more clay, like La Morra, tend to perform better in years in which there is less precipitation, while they suffer in more rainy years. However, Igor Boni, the lead soil researcher in the Soster Barolo study, points out, "In normal climatic years, vines in sandier soils generally perform better because they produce less, accumulating more sugar in the grapes." Beds of sand in the subsoils are also crucial, since they allow roots to easily grow far beneath the surface, where they can have access to more water and nutrients, and this may partially explain why healthy, old vines are not uncommon in the denomination when compared to other wine-producing areas in Italy, although there are other reasons for this that will be discussed in chapter 2 on Nebbiolo. One of the fundamental components of the Langhe's soils is calcium carbonate (the principal component of limestone), which is present in the topsoils. It is generally agreed that the higher the amount of calcium carbonate in the soil, the more structure the wine will have. It was therefore unsurprising to see in Soster's Barolo study that out of the fifteen test sites, the four from the village of Serralunga d'Alba, the village most associated with powerfully structured Barolos of great longevity, had the highest amounts of calcium carbonate, while vineyards in La Morra, which produce among the most elegant Barolos, tend to have the least amount of calcium carbonate. This data was backed up by the region's aforementioned data bank, Banca Dati Regionale dei Terreni Agrari. Once again, to put this aspect of the area's soils into perspective, the average amount of calcium carbonate was far lower in Roero: an average of 16 percent compared to Barolo's average of over 23 percent, with some Roero villages like Vezza d'Alba having only 11.6 percent calcium carbonate overall. When compared to Serralunga's 28.9 percent calcium carbonate, La Morra's 19.9 percent, or the village of Barbaresco's 18.6 percent or Neive's 23.2 percent, one can understand why Roero Nebbiolos have a more delicate structure than their Langhe counterparts. But, as Igor Boni points out, the region's Barolo study also revealed that, based on calcium carbonate alone, two vineyards within the same village and even lying side by side can have "soils with different characteristics," and that there are often "different rock sediments within just meters from the crest further down," proving the wide variety of soil conditions in Barolo that have not, or perhaps cannot, be defined by mere statistics regarding certain components. It's important to note at this point that while the region's data banks on agricultural land can give averages, the data banks represent basically a collection of fragmented studies carried out by individual producers over numerous years. At the same time, the Barolo study funded by the Piedmont Region looked at only fifteen test sites, which makes it difficult to make sweeping judgments about the entire denomination, yet it is still a valuable guide to understanding the area. Sadly, and rather shockingly, no such in-depth study has been repeated, and one has never been performed in Barbaresco, where the main geological formation is Sant'Agata Fossili Marls. As geologists point out, one feature of the Barbaresco zone, also found in the Barolo denomination, is that the topsoil is very thin and in some places lacking entirely. This fact is confirmed by Barbaresco producers themselves, and according to Italo Sobrino of Cascina delle Rose, "Having a very thin topsoil means that the roots of my vines go straight down to the much older soil beneath the surface, where there is more water and nutrients." On one final note, the Barolo study headed by Soster discouraged further such studies when it declared in its conclusions: "Even the soils, which are found on sites with different exposures and that present very different particle sizes, seem to have no real influence on the musts and wines." For more on the soils of individual villages in Barolo and Barbaresco, please see their respective chapters in parts 2 and 3. Wedged between the Maritime Alps and the Apennines of the Italian Riviera, the lower area of the Langhe, where the Barolo and Barbaresco denominations lie, has a temperate continental climate with hot summers and cold winters. However, the Apennines protect the area from storms and cold air currents arriving from the sea, while the warmer Mediterranean air tempers the colder air coming down off the Alps. Because of the many different hills and ridges, both the Barolo and the Barbaresco growing zones boast a number of different microclimates, which have a crucial effect on Nebbiolo's ripening. Both denominations also benefit from significant differences between day and night temperature changes during the summer months, prolonging the growing season that in turn generates wines with more intense aromas and complexity. Barolo, where the best vineyards lie between 200 and 450 meters (656 feet and 1,476 feet) above sea level, has a longer growing season than Barbaresco. Barbaresco, which has approximately the same vineyard altitudes as Barolo, has a milder climate thanks to its closer proximity to the Tanaro River. Breezes generated by the river give much needed ventilation in the summer time while creating cooling mists in the early autumn-ideal conditions for Nebbiolo. Generally speaking, these conditions allow the grape to reach more uniform and earlier maturation in Barbaresco than in Barolo. For more on climate and how climate change is affecting Nebbiolo, see chapter 2. Artifacts collected at the Federico Eusebio Civic Museum in Alba show that the Langhe was inhabited in Neolithic times, but the first permanent settlers in the Langhe are presumed to have been tribes of Celtic-Ligurian origin who populated the area in the fifth century B.C. Seeing that these tribes migrated from the Ligurian coast, where the ancient Greeks had already introduced viticulture, there is speculation that these tribes introduced grape growing and winemaking in the Langhe. In the first century B.C. Alba was founded as the Roman town of Alba Pompeia, and as the Romans were infamous consumers and connoisseurs of wine, we can be sure that they were growing grapes for wine production. Pliny the Elder confirms this supposition a century later when he extolled the suitability of Alba's soils for growing vines. Other proof is found in Alba's Civic Museum, where an ancient gravestone found in Pollenzo is inscribed to Marcus Lucretius Crestus, Merkator Vinarius, or "wine merchant." After the fall of Rome, barbarian invaders took over the area, and lent their name to the village of Barbaresco, which derives from Barbarica Silva, meaning "woods of the barbarians." From shortly after the fall of Rome until the late Middle Ages, during the rule of the Lombards and later when the area was annexed to Alba during Charlemagne's rule, the Langhe hills were subjected to numerous raids carried out by bandits, and it is believed the area was sparsely inhabited. According to historical chronicles, in the tenth century, King Berengarius allowed for a fortification in Barolo, a precursor to the castle standing there today, to deter nearly a century of Saracen raids. In the early thirteenth century, land ownership and territorial divisions became more peaceful, and the areas around Barolo and its surrounding villages changed hands numerous times. The fortunes of the village of Barolo and the rest of the lower Langhe changed forever in 1250 when the Falletti family acquired Barolo and the surrounding areas from the Commune of Alba. In the thirteenth century, the Fallettis were a wealthy family but not of noble origins, and they peacefully gained control over much of the land around the village of Barolo, counting some fifty large holdings by the year 1300. In 1486 Barolo became part of the State of Monferrato, and its marquis invested Tibaldo in 1631 with the power of his vassals in Barolo and its surrounding areas. That same year, Barolo became part of the House of Savoy, and during these tumultuous times Barolo and its environs, which had been granted the status of county, suffered greatly at the hands of the French during France's struggle for power with Spain. In 1730, the Falletti's Barolo properties were transformed into a marquisate, or territory ruled by a marquis, and Gerolamo Falletti IV became its first marquis, or marchese in Italian. The last Marchese di Barolo, Carlo Tancredi Falletti, married French-born Juliette Colbert di Maulévrier in 1807. The two lived in Turin but summered in Barolo, where the family still possessed extensive holdings, and where, by the 1830s, they played a fundamental role in the birth of Barolo (the wine), but more on this in chapter 3. Following on the success of her books on Brunello di Montalcino, renowned author and wine critic Kerin O’Keefe takes readers on a historic and in-depth journey to discover Barolo and Barbaresco, two of Italy’s most fascinating and storied wines. In this groundbreaking new book, O’Keefe gives a comprehensive overview of the stunning side-by-side growing areas of these two world-class wines that are separated only by the city of Alba and profiles a number of the fiercely individualistic winemakers who create structured yet elegant and complex wines of remarkable depth from Italy’s most noble grape, Nebbiolo. 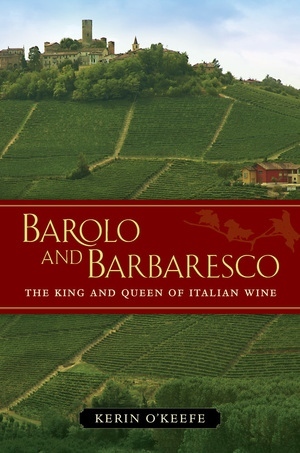 A masterful narrator of the aristocratic origins of winemaking in this region, O’Keefe gives readers a clear picture of why Barolo is called both the King of Wines and the Wine of Kings. 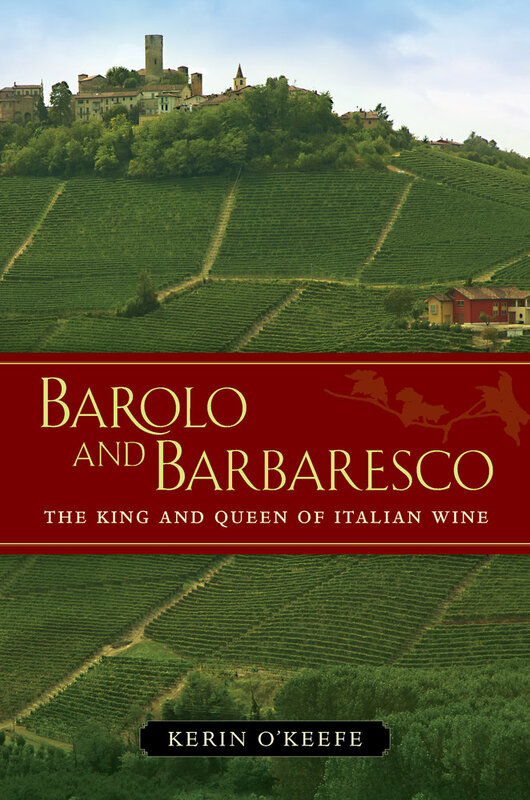 Profiles of key Barolo and Barbaresco villages include fascinating stories of the families, wine producers, and idiosyncratic personalities that have shaped the area and its wines and helped ignite the Quality Wine Revolution that eventually swept through all of Italy. The book also considers practical factors impacting winemaking in this region, including climate change, destructive use of harsh chemicals in the vineyards versus the gentler treatments used for centuries, the various schools of thought regarding vinification and aging, and expansion and zoning of vineyard areas. Readers will also appreciate a helpful vintage guide to Barolo and Barbaresco and a glossary of useful Italian wine terms. Kerin O’Keefe is the author of Brunello di Montalcino (UC Press, 2012) and of Franco Biondi Santi: The Gentleman of Brunello (Veronelli Editore, 2005). She is the Italian Editor for Wine Enthusiast magazine, and her numerous articles on Italian wine have been published in top industry publications, including The World of Fine Wine and Decanter. "Part narrative history, part guidebook, Kerin O’Keefe’s exuberant engagement of the Italian Piedmont’s 'royal' oenological culture further illuminates the ways in which horticulture, geography, and good old-fashioned local characters intersect to produce some of the world’s best wines. Barolo and Barbaresco is not just a compelling read, it also reveals itself to be essential." --Matthew Gavin Frank, author of Barolo and Preparing the Ghost.